Each month a member of staff is awarded the “First Directory Superstar” award for going above and beyond what’s expected of them. This month in recognition of her fabulous team spirit and the example she sets to us all Louisa was awarded this trophy, and some incredibly decadent chocolates, as well as the opportunity to tell you all why she’s here and how our company fits into her life and career. What is the key to happiness? How do I become a success? Why do I sometimes punch myself in the face when I’m pulling up the duvet? All very important questions, I think you’ll agree. Well … I don’t know the answer to all of them, but I can shed a modest spotlight on a couple of them. I decided last year to take positive action and find a new career. I wanted to stop doing a boring secretarial job and do something completely different. I became disillusioned with the drudgery of filling in spreadsheets and organising someone else’s diary. The lure of coffee making and minutes taking was beginning to wear thin and after 20 something years of touching typewriter keys I decided to channel my best endeavours into a proper career, that I actually enjoy! Something that makes me happy and brings success. I found all of these things at First Directory. I briefly flirted with the idea of becoming a professional dancer, (mainly because I am a huge fan of Strictly come dancing), but then I realised I’m 47 and have a bad back… hmmm. Sanity prevailed and I applied for a sensible job. Actually I applied for hundreds of sensible jobs, but having no experience tends to be a disadvantage and very few employers noticed my brilliant potential. Happily First Directory detected a hint of genius (or something) and my journey began. The interview process was arduous; four stages of fear! Stage one was a phone call from the managing director. My CV must have had something good in it, so I tried selling myself without sounding a fool. Not easy when he calls at early o’clock on a Monday. I attempted to give the impression that I’d been up and alert for hours in fully lucid state, rather than the reality, which was pyjama clad torpor. Stage two was an online test, which proclaimed me not to be a lunatic so this flowed naturally to stage three which was an actual face to face interview. No pyjama’s this time, instead a smart business suit and nicely combed hair (school photograph style). I did talk too much but said the right things because this led to stage four…. the role play interview. Hours hunched over a blank piece of paper attempting to write what I planned to say, then came the actual call to the boss, who was pretending to be Mr – not interested in marketing – customer. Success! I got him interested enough to offer me a job. They wanted me! Hurrah a new job and a new career! I was happy but scared. Very scared actually… What was I doing? The negative voices were starting to whisper “I’m a middle aged Miss Money Penny. I can’t change now, I’ve always been a secretary, I’m good at being a secretary. The salary is ok… ish. The work isn’t that boring….”. Actually NO! I said to myself, sternly. Come on!!! It’s time to change. Change for the better!!! I’m sick of not seeing a light at the end of the tunnel. I’m going to flippin well stomp down that gloomy tunnel and turn the b*****d light on myself.. The first week was a whirlwind of training that was essentially learning all the ins and outs of successfully marketing a business through the medium of the online directory and trying to understand the technical minefield that is ‘the internet’. I confess now to stifling 6 yawns, but I managed to absorb 87% of the information offered… so far so good. Armed with my new found knowledge they allowed me to use the telephone! It was hard at first, I had never met with such a challenge before, and there were times when it got the better of me. I sounded like a chipmunk on helium that first week, and unsurprisingly not every business man or marketing manager had the patience to listen to me, and some people just didn’t want to understand. Some people were simply not interested and that’s fine, I’ve developed a backside fashioned from the thickest of rhino hide and a backbone made of titanium. I picked myself up (more than once) and I can hold my own now. I spend my days talking to customers; helping them get better marketing exposure for their business. Most of our customers are lovely people and an absolute joy to talk to. Some of them are grumpy, but not for long; I put my happy hat on, and get them smiling. I have been on a profound learning journey, and and emotional journey too. It’s only now -one year later- that I feel confident about my new vocation. The agony of gaining a new skill is far outweighed by the ecstatic feeling of a job well done. My family has always labelled me ‘little miss chatterbox’, and who would have thought I could earn a good living by talking all day. I still can’t believe I’m getting away with it. But stop! Wait! I’m sounding frivolous…. It’s much more than just talking. It’s a passion, it’s fervour, it’s joy …It’s belief. Belief that our directory can help. And it really does. First directory is appropriately named! It’s the first directory you need, and it works. It’s simple and uncomplicated. It’s the ideal tool to find the right supplier. It is the catalyst that lights the spark for industrial buyers to find the right products. 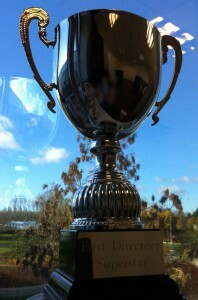 First also means winner… and I am surrounded by winners at First Directory. The team vibe is amazing, and that brings me back to Strictly. The dancing dream may not have been practical (in fact if I’m honest the ambition to dance was just my secret wish to repeatedly put my hands on Artem Chigvintsev – I do love him!) and I may not be Darcy Bussel, but this is my personal ‘Strictly Come Dancing’. The similarities are striking. It’s a challenge every day. It’s hard work, and it’s constant hard work, no slackers allowed! The payoff is that it feels fantastic when it goes right. It’s like a standing ovation in the Albert Hall, it’s the Oscar winning performance that brings a tear to your eye, it’s the Olympic athlete breaking the tape for the gold medal. All of these things take effort, but by golly they are worth it. Marketing is such a passion with me I eat, sleep and dream it! It’s been a tough journey, but I’m so glad I took the leap and changed career. I am constantly amazed by the huge number of proper grown-up humans, who don’t follow their hearts, who don’t find the job that makes them happy. But I shouldn’t be surprised because I was one of those humans! I coasted through life, just marking time. It wasn’t until I came to First Directory that I found a personal challenge that really gets my face smiling and my mojo tap dancing! My old job was nice. I chugged along nicely, doing nice work, in a nice office, with nice people for a nice salary. I don’t do ‘nice’ anymore! I need to learn, and improve, and be the best version of me that I can possibly be! I’m constantly striving for improvement and I know I still have a huge amount to learn. However, I love my job! I laugh out loud every day, I sing out loud too (slightly annoying), I high five my colleagues when we do well and I go home knowing I’m a success. Ok the duvet still gets the better of me, sometimes. Hey! I don’t have an answer to everything. Just the happiness and success stuff! This entry was posted in Behind the Scenes, Interviews & Buzz on November 28, 2013 by First Directory.